Join a sharp shooter in the wild, wild west in Gunslinger: Reloaded, a 5 reel, 25 payline slot game from Play ’N Go. This cowboy adventure comes with a free spins round where payouts are doubled, a bounty hunt with multipliers and a potential progressive jackpot. Take aim, on all devices, from between 25p and £100 per spin. The design in Gunslinger: Reloaded is very well done. There’s a sepia tinge to the visuals which works really well. Set against a dusty wild west town, you’ll see playing card and poker chip symbols alongside a sheriff’s badge and a locket. The best standard symbol is the pouch of gold nuggets which awards 40 times your stake if you land 5 on the same payline. The bounty hunter is the wild. Land 5 of these on a payline and you’ll pocket a mighty 400 times stake reward. The game also comes with a horse scatter which offers awards of 2, 3, 15 or 150 times your stake. It doesn’t trigger a feature though. For that, you’ll need to land the bottle scatter on reels 2, 3 and 4 on the same spin – you’ll then activate the Bottle Spins Free Spin feature. Shoot 1 of the bottles to reveal the number of free spins awards. This will be between 10 and 25 free spins. All payouts during the free spins are boosted by a 2x multiplier and doubled. The feature can be retriggered infinitely for an unlimited number of free spins. Now, the associated multiplier is then applied to all stages during the feature – this means you could win 72 times your stake from Jessie Picket, 216 times your stake from Butch Curry or 960 times your stake from Wild Bill. 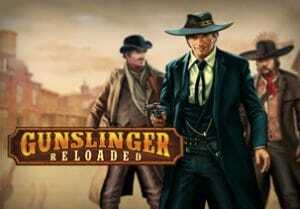 Gunslinger: Reloaded also offers the chance to land a progressive jackpot prize. You need to collect each of the Poker Cards with winning combos. The progressive jackpot will be yours if all poker cards display the sheriff badge on them! This is known as the Shoot the Cards feature. Play ’N Go has created an impressive looking game here. The design could come straight out of a western movie. They’ve packed a decent variety of extras here too. It’s not a particularly volatile game though. The variance here is in middle range so expect plenty of bang for your buck. Saying that, you can win 5,000 times your stake on every free spin. TV and films westerns have gone out of fashion. The theme remains popular with players though. Gunslinger: Reloaded is a pretty good example of the genre, combining excellent looks and sound with some interesting extras. I also suggest you try Dead or Alive, by Net Entertainment, which is highly volatile and takes you to the Wild West.